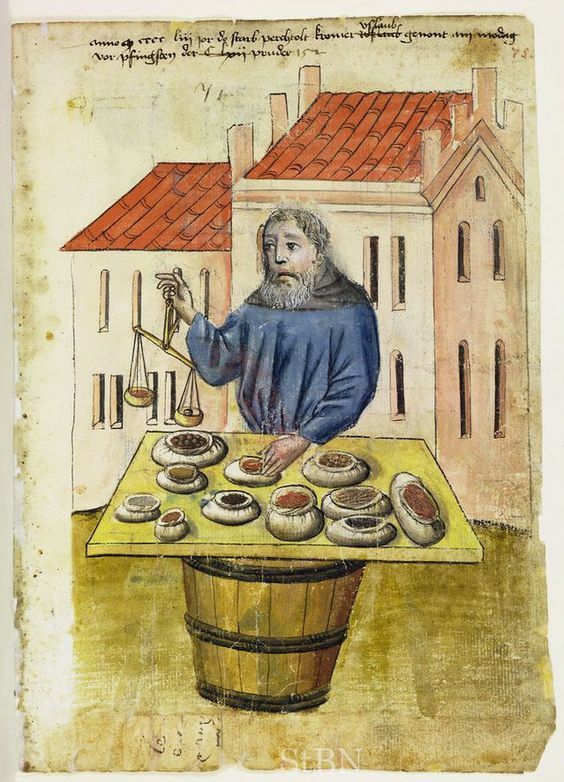 Medieval food: What did medieval people eat in Denmark? 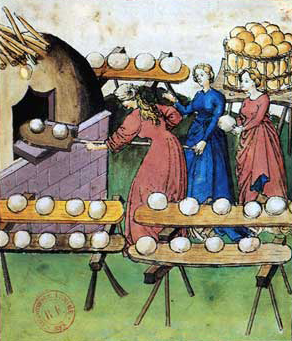 What did medieval people eat? What ingredients did medieval people in Denmark have to cook with? Which method did they have to cook with and how did they preserve their food? A while back I did a post on what the vikings ate, which I found really helpful my self when constructing new viking age recipes. I thought I would make one for the medieval period as well. This post is focused on what people in Denmark ate pre-Columbus. I am not an expert so I build this on what other people have written about the period. This is not a complete list of course but is meant as a base to work from. The heavy basis of Danish medieval food was bread, porridge and gruel. Much of the population did survive on this and little else – especially in early spring when the stocks might be empty. That said many people did eat more interesting things than that and big portions of the population served in richer households where they would be feed. The nobility also hosted lavish feasts where left overs were given to beggars after the feast. That means that a bigger proportion than you would think actually got to taste the lavish noble food that you find in the medieval cookbook. Man herding pigs. Note how hairy they are – they look more like boars than modern pigs. Fish and water animals were very important during lend and fast periods when the Catholic church subscribed not eating meat. 180 days a year were non-meat days – every Wednesday and every Friday. Beef, in Denmark it was common for a farm to have 2-3 cows. The biggest producers had about 50 cattle for meat production. 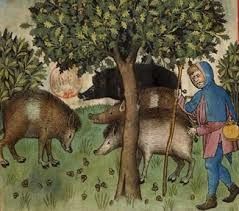 Pork, they looked more like boars than domestic pigs. Herring, fresh, salted or salted and smoked was really imported during lend and other fasting periods. A huge export from Denmark via the Hanseatic League and the Nederlands. 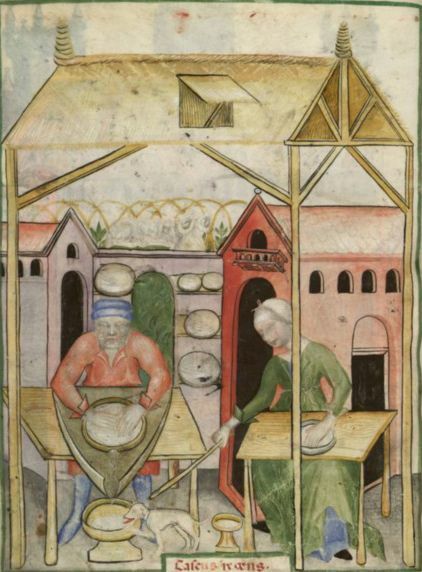 You could do a long blog post or really a book about the history of bread and the bread in the middle ages – for now I will just put a few remarks next to each item. A few grains were used as filler – that is to say that you put it in the bread to stretch the flour if you were short. Wheat, expensive and sparely used in everyday cooking. Wheat wasn’t grown much in Denmark in much of the medieval period, so most it often had to be imported, which of course pushed up the price. Primarily used by the nobles and rich people or for feasts. It was also used in religious contexts. The price of wheat was about twice of that of rye. Rye, most bread was rye-bread sometimes mixed in with other grains. The most commonly grown grain in Denmark. Barley, used in porridge, as filler in bread and for brewing beer of course. Malt: Both used in beer production and as a sweeter. Oats, were primarily used as animal feed or as filler in bread or porridge. Rice: Imported and used both for porridge and as rice flour. Peas: Dried and used in porridge and milled to flour in bread. 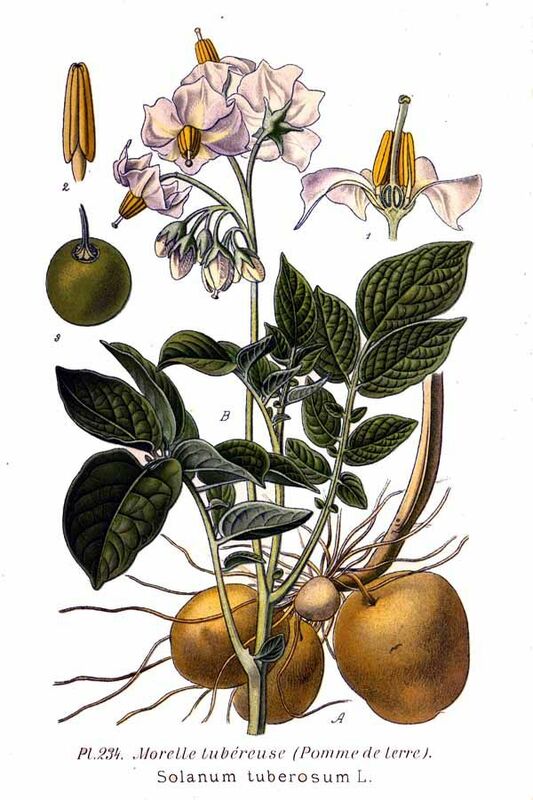 Many plants that we take for granted don’t seem to be commonly grown in Denmark in the middle ages. Which seems weird as they grow just fine and are know in the rest of Europe. Many root vegetables were not grown. I need to do some more research on these but it seems that all of these were not commonly grown in Denmark until after 1520 – which is almost unfathomable. * Things that was not common in Denmark til the renaissance. Selleri: The tops were used in cooking while the root were used for animal feed until much later. Citrus fruits, imported or grown in greenhouses at the noble’s mansions where know. And of course dried or candied peal might also be imported. Spice Merchant with bags of dried spices, Berthold Uslaunb. Illustration: the House Books of the Nuremberg Twelve Brothers Foundation, records of a charitable foundation started in the city of Nuremberg in 1388. Spices and herbs played a huge role in medieval cooking. It does not seem that the spices were used to cover up meat that has gone bad, but rather as status symbols and medicinally. Herbs could be either wild plants, plants grown in gardens or in cluster gardens or of course imported in dry form. It’s interesting how many of these spices that has been re-introduced to Danish cooking over the last 20-30 years – many of which had fallen completely out of favour and things like grains of paradis are still not available in Danish stores. Some of the herbs are perhaps more medicinal then used for general food preparation. *Imported spices from the middle east or the Asia. Dandelion, taste almost like bitter rocket. Can be used as a salad green. Milk, from cow, goat and sheep. Cows milk were generally not drunk raw. Some of the ways that people prepared and preserved food. I am still researching this part. Grinding things in a morter: Very importent not only for spices but for everything we would use a blender for. Drying of grain, fruits, berries, vegetables and other food stock. Smoking of meat, sausages and to a lesser degree fish it would seem. Due to being from the new world. 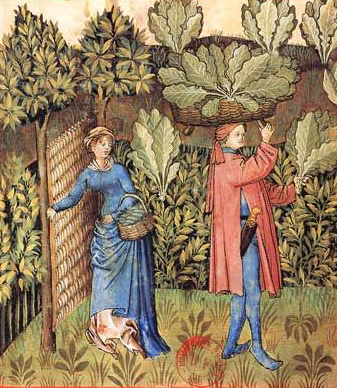 While some meat was very fast to catch on after 1492 most plants took longer. People are generally way faster to start eating a new meats than new plants, as new plants are way more likely to be bad for you, than meats. Pumpkin & zucchini/squash*5Though calabash was know. Read more. However the american pumpkins were fast to catch on in the renaissance/early modern period and there are amazing paintings of them. Tea6Were introduced in the 1600’s and widely adapted among the elite in the 1700’s. Coffee7Were introduced in the 1600’s and widely adapted among the elite in the 1700’s. Cocoa/chocolate8Were introduced in the 1600’s and widely adapted among the elite in the 1700’s.